Diamond, White 18 carat gold, yellow diamond, Ruby & Sapphire interchangable rings.Total Gold 11.72 grams, Diamonds 1 carat other stones total of 1.26 carats.Total valuation of 2 rings $13,000. Can be purchased seperately. Diamond & Green Tsavorite Garnet Gold Ring. Rare Green Demantoid Garnet Butterfly Gold Brooch. 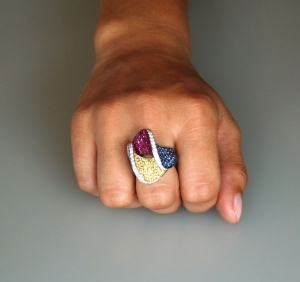 Diamond, Emerald, Ruby, & Sapphire Gold Ring. Diamond and Yellow Sapphire Gold Ring. Black & White Diamond Gold Ring. Diamond & Gold Leopard Ring. Diamond, Ruby, Sapphire and Gold Serpent Ring. 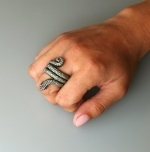 Diamond, Gold, & Ruby Serpent Ring. Diamond, Amethyst, & Enamel Gold Ring. Diamond, and Emerald Serpent Gold Ring. Silver & semi precious multi gemstone bracelet.